You've envisioned how your day will begin, with your maid of honor and bridesmaids there to support you every step of the way.. laughing with excitement as you have your hair and makeup done, knowing that within just a few short hours, you will finally marry the man of your dreams, and start a brand new chapter of your life, one that will be the longest and most fulfilling journey you've ever taken. "Discover Exactly How You Can Have The Wedding Of Your Dreams Without The Hefty Price Tag Of A Luxury Wedding!" *Discover exactly what you need to say when dealing with wedding vendors so that you are able to negotiate the best deals, stripping away hundreds of dollars in costs! *Tried and tested methods of purchasing your wedding attire at insanely reduced costs, regardless of how big your wedding party is! These strategies have saved couples thousands of dollars in costs that could be put towards your honeymoon! *How to choose the right reception location to ensure that your day is the best that it can be! Choose the wrong location and your wedding reception will be an absolute disaster! I will reveal the insider strategies of choosing the ultimate reception location regardless of your location or budget! *How to save $200.00 on your wedding invitations, instantly! These proven strategies will shave hundreds of dollars of your costs, easily! *How to plan out every detail, every element like a pro!! My step by step blueprint to wedding planning will ensure that you address every element like a professional wedding planner, giving you the ability to scoop up deals that are never available to "regular" brides without a representative doing business for them. Don't sacrifice the most important features of your wedding simply because you don't know how to get around the over-priced rates of wedding vendors. There are surefire tactics that you can use to save hundreds of dollars on your wedding without having to cut out elements, downsize the guest list or take away from your very special day. After all, it's one of the most important days of your life and it should be celebrated that way! Saving Up To 75 Percent Of Your Wedding Planning Costs!" Wedding vendors are in the business of making money by taking advantage of and exploiting the excitement that couples feel at the thought of their big day.. and they know that it's a time in your life when you aren't all that concerned about costs, even if you know that you will later regret it as you are stuck paying off a severe debt many years to come. It certainly isn't the way that I wanted to start mine, and so I hired one of the best (and most expensive) wedding planners in my area. What I discovered however, is that the tactics they use to save money when speaking with vendors and negotiating deals were downright simple! Had I known how to "talk the talk" and present my offers and ideas in a way that wedding planners do, everything would have been so much easier.. AND I would have been able to save the $7,000 I spent on the wedding planner! I decided to write down everything I learned so that other brides could spare the costs of hiring a wedding planner and still down on the costs of their weddings.. even as much as 75 Percent! I'm giving you a full 60 days to review my wedding planning blueprint. If after implementing my strategies you have not saved hundreds (if not thousands) off of your wedding planning, I will refund every single dime of your purchase - no questions asked! I am that confident that my wedding planning blueprint will help you plan out every detail of your wedding at a fraction of the price, that I am able to offer this guarantee knowing that it's very unlikely you will ever want a refund, because these techniques actually work! 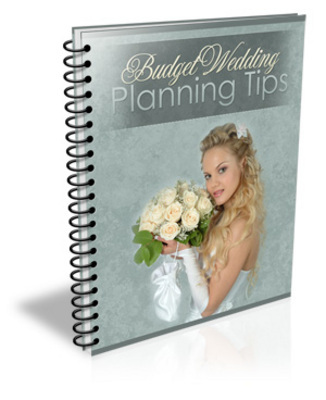 Complete Guide To Wedding Planning On A Budget!" You will gain instant access to the entire planning guide. No portion of this ad can be copied without written permission from the author.